The official Twitter account of the All Progressives Congress (APC) Nigeria, @APCNigeria, is currently being used to trade cryptocurrencies, including bitcoin and ethereum. The account name has been changed to Justin Sun, who claims to be based in San Francisco, United States. The header photo was changed to show a message: “Tron. Decentralize the web”, while the profile picture was immediately changed to that of a young man of Asian descent. 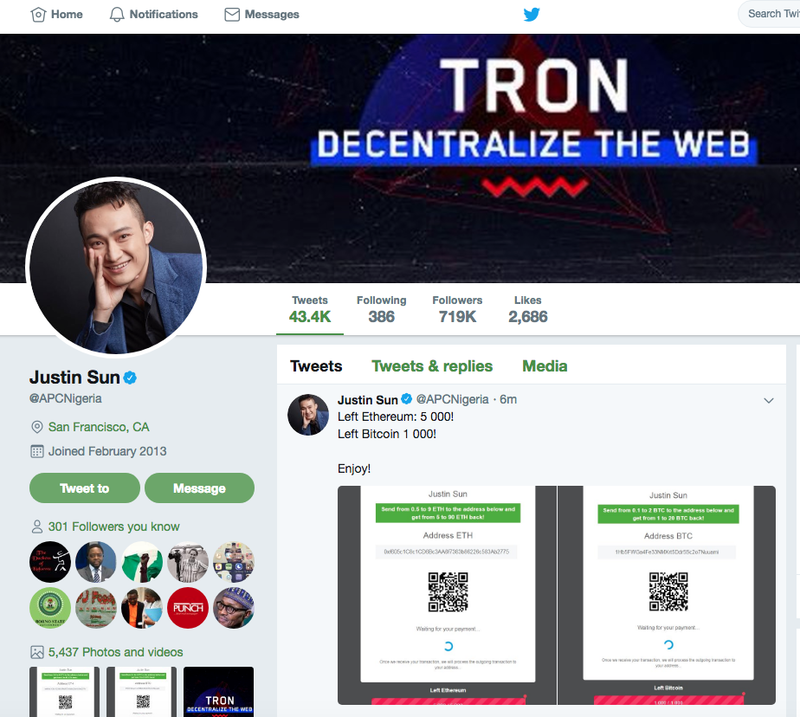 APC’s account was used in retweeting Justin Sun, who has a verified account and claims to be founder of Tron Foundation and one of the Forbes 30 Under 30. 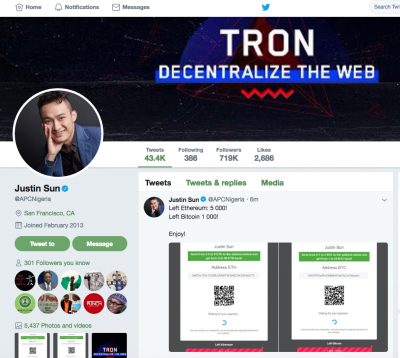 The account was recovered by the handlers at some point, and Sun’s tweets were deleted, and APC logo restored, but the party has again lost the account to the Tron founder. According to Investopedia, “Tron is a blockchain-based decentralized platform that aims to build a free, global digital content entertainment system with distributed storage technology, and allows easy and cost-effective sharing of digital content”. Tron was founded in September 2017 by a Singapore based non-profit organization called the Tron Foundation. The APC is yet to report any hack of its official account. We giving 1 000 BTC to the people of Nigeria! Just send 0.1-2.0 BTC to the address below and we will send back to you 1-20 BTC. We love our people, enjoy! We are going to raise wages, and for this we want to celebrate this, and give everyone the bitcoins. Our government has created a website in order to give you bitcoins. The President of Nigeria sold me this even record, for 2k$, he said that he lacks money, and I agreed to buy his account with 700k followers, a good deal. It's amazing, the president asked me to buy other accounts, I'm going to buy them. I'll ask him if he can sell me Nigeria itself?